Decatur, Georgia, this article is about Decatur, county seat of DeKalb County. For the county also located in the U.S. state of Georgia, see Decatur County, Georgia. Decatur is a city in, and the county seat of, DeKalb County, Georgia, United States and is part of the Atlanta metropolitan area. With a population of 20,148 in the 2013 census, the municipality is sometimes assumed to be larger since multiple zip codes in unincorporated DeKalb County bear the Decatur name. The city is served by three MARTA rail stations. 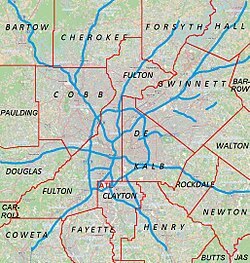 The city is located approximately 5 miles northeast of downtown Atlanta and shares its western border with Atlanta. Decatur has a thriving art and festival scene. The Decatur Arts Alliance hosts the Decatur Arts Festival each May, in addition to installing public art around the city, providing gallery space for local artists, producing YEA!, which is an event for young emerging artists, and supporting arts and arts education throughout the City. Decatur is home to Eddie’s Attic, which is a live music venue hosting shows almost every night. Decatur is known for its frequent festivals, which include the annual Decatur Arts Festival, Decatur Stirs, Decatur Beach Party, Decatur BBQ, Blues & Bluegrass Festival, the Decatur Book Festival, the Decatur Maker Faire, The Decatur Beer Festival and the Decatur Wine Festival. Other events throughout the year include parades, Concerts on the Square, wine crawls, art walks, runs, and races. Public art in Decatur includes Celebration (artist Gary Price), Valentine (artist George Lundeen), Thomas Jefferson (George Lundeen), Commodore Stephen Decatur (artist unknown), Roy A. Blount Plaza, and Living Walls Murals (various artists). Yatu and the ladies have been braiding my hair for over 8 years. This is the number 1 spot ladies, trust and believe. My braids are always looking extra. Diamond’s loving her burgundy box braids as always. Peace and love.